Besides, the new build fixes a number of errors in trading signals operation and implements many minor improvements. Attention! From August 1, 2013 client terminals older than build 439 will be no longer supported. When One Click Trading mode is enabled, the trading dialog is closed right after a successful operation. In case of an error, the dialog displays its cause. 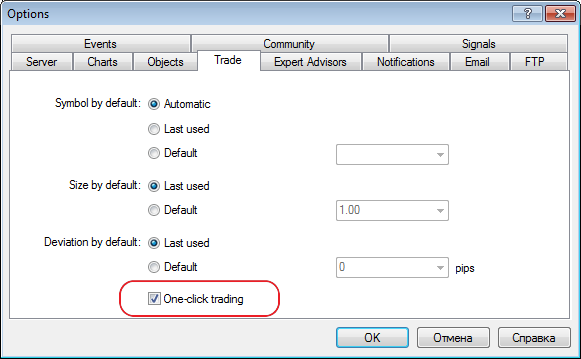 When One Click Trading mode is enabled, Close command in the position's context menu results in an immediate closing of the position without showing a trading dialog. Added ability to drag and drop trading levels of orders and positions. To set SL and TP levels on position, just drag a trading level of an order upwards (TP for "BUY" positions) or downwards (SL for "SELL" positions). 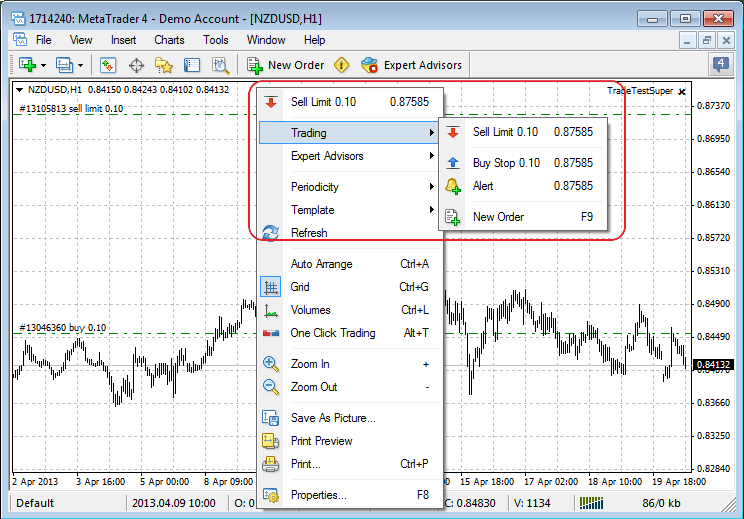 When One Click Trading mode is enabled, dragging trading levels of orders and positions results in an immediate modification of the appropriate order or stop level without showing a trading dialog. Revised the context menu of trading from the chart, added ability to set alerts right from the chart. Terminal: Added a tab displaying brokerage company's support web site. Terminal: Fixed errors causing freezes of trade requests during massive trading from MQL4 applications. Terminal: Fixed display of a price chart in case of large range of values. Terminal: Fixed display of prices with accuracy of 4 decimal places on the quick trading tab of a chart. Terminal: Fixed saving a chart screenshot in "Active chart (as is)" mode. Terminal: Optimized client terminal's work with large volumes of trading history. Terminal: Removed check for the absence of SL and TP when opening positions for trading symbols of Market Execution type when trading from MQL4 applications. Terminal: Added logging of operations with trailing stops. Terminal: Fixed trading via "Popup prices" window of Market Watch. Terminal: Fixed display of tooltips in the terminal's trading history tab. Terminal: Fixed calculation of trading history results in basic and extended history reports. Terminal: Updated translation of the client terminal's interface into Polish and Croatian. Signals: Fixed copying trading signals that sometimes led to re-copying of trading position after it was closed. 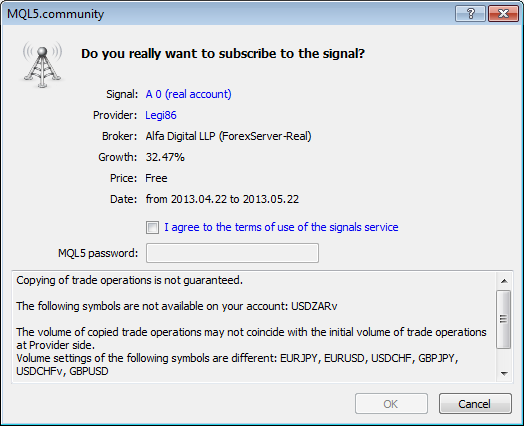 Signals: Added detailed warning of different trading symbol settings at Signal Source and Subscriber's sides to the signal subscription dialog. This reduces the probability of subscribing to a signal, which is incompatible with Subscriber's trading account. MetaEditor: Fixed working with clipboard when using the Chinese language. Did anyone - whoever tried this build - mention, if the fixes include resetting indicators after changing a trade account? I've an important question. If I don't want to use One-click trading and the checkbox is OFF at the settings panel, why on earth the drag'n'drop sl/tp line moving function still works? It's very annoying, it's like you don't test the functions before hit the publish button. It's really hard to move any horizontal lines which are exactly at the default lines' positions. I would like to get an answer from a competent person at MetaQuotes: when this will be fixed. Also I would like to contribute some translation issues regarding the Hungarian language in MT4, to who should I send the problems? If you want to report a bug, you have to write to ServiceDesk on mql5.com site. I suggest you tone it down if you want to be welcomed. Well, where is this 500 version, my real Admiral Markets trading platform shows 499 version! and MetaQuotes demo(user:55555) platform shows 499 version! OK, after second run of MT4 platform, update shows 500 number. I don't think that anything was wrong about my tone. It's not good feeling to see that a brand new function and its connected setting is not working properly. We're not talking about a huge upgrade, we're talking about a very tiny new function. The source of my tone is this. I don't know if you are a programmer, but what seems a "very tiny new function" can sometimes hide a lot of work. It's always better to show respect for others work if you want ask something. I think a possibility would be useful to disable codebase and signals, these only vaste resources (bandwidth, memory) when not used. Signals are loaded even when login info is not filled in. Fill free to write to ServiceDesk with that suggestion.